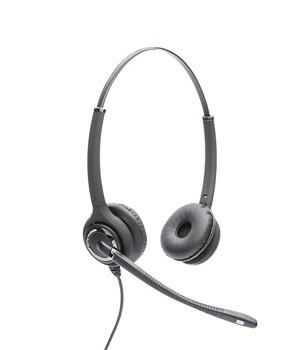 The top model of professional AxTel headsets dedicated to business customers. The headset delights with its appearance, design and aesthetic qualities. It is designed with exceptional attention to every detail and made with the highest quality materials. Flexible microphone boom and 10 positions of headband adjustment guarantee all-day work comfort. To meet expectations of the most demanding users, the headset has been equipped with HD voice speakers. This ensures crystal clear sound quality. Microphone with excellent noise cancellation delivers efficient performance even in environments with high levels of background noise. It serves as an ideal solution for offices as well as Call Centers. Two perfectly adjusted speakers enable the user to isolate from the surrounding environment. The top model of professional AxTel headsets dedicated to business customers. The headset delights with its appe- arance, design and aesthetic qualities. It is designed with exceptional attention to every detail and made with the highest quality materials. Flexible microphone boom and 10 positions of headband adjustment guarantee all-day work comfort. To meet expectations of the most demanding users, the headset has been equipped with HD voice speakers. This ensures crystal clear sound quality. Microphone with excellent noise cancella- tion delivers efficient performance even in environments with high levels of background noise. It serves as an ideal solution for offices as well as Call Centers. Two perfectly adjusted speakers enable the user to isolate from the surro- unding environment.